Indonesia Millennial Report is the complete guide to understanding the Millennial generation in Indonesia. We covered from religious view, family, education, media consumption, internet & online behaviour, entertainment & leisure, consumption behaviour, and political view. 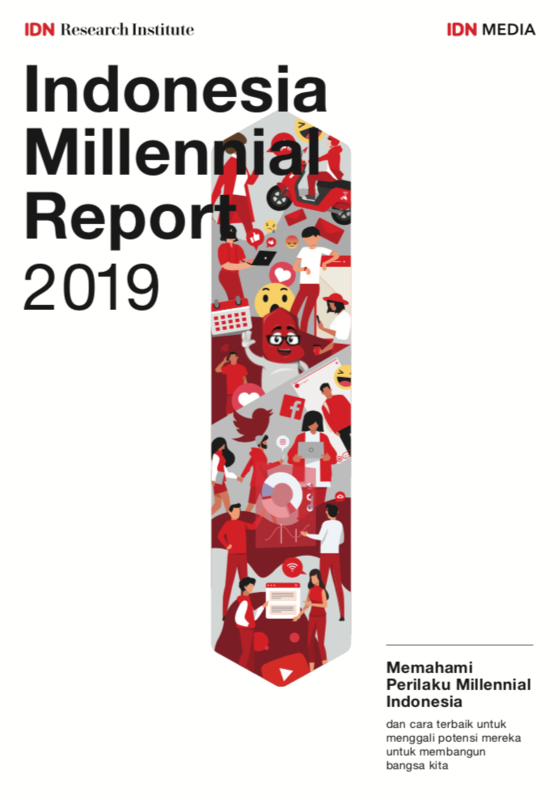 We conducted survey with more than 1,400 Millennials, multiple focus group discussions, and in-depth interviews in ten major Indonesian cities: Medan, Palembang, Jakarta, Bandung, Surabaya, Semarang, Denpasar, Mataram, Pontianak, Balikpapan, Manado, and Makassar. IDN Research Institute IDN Research Institute is an independent fact-tank that informs the public about the issues, attitudes and trends shaping Indonesian Millennials. We conduct public opinion polling, demographic research, content analysis and other data-driven social science research. We generate a foundation of facts that enriches the public dialogue and supports sound decision-making. We’re committed to meeting the highest methodological standards and exploring the newest frontiers of research. We are led by a team that combines the observational and storytelling skills of journalists with the analytical rigor of social scientists.